There are cars, and then there are classics. Anyone who owns a classic car - or two - can relate to this statement. However many classic cars a person may own, chances are these vehicles are not for everyday use. They are also not the type of car most people will want to leave parked in their driveway or on the street. Even under a tarp, a classic car is not fully protected. Like a piece of art, a classic car needs more if its beauty is to be preserved. When the purchase of a classic car is in the works, it is time to consider how this vehicle will be stored. It may seem convenient to store the classic car in the garage, which would then mean that everyday vehicles are pushed into open driveway storage, leaving them susceptible to the elements and to theft. The average garage is also home to seasonal and sporting items as well as boxes of belongings that have no place inside the home. With the clutter that can exist in the garage space, there is a risk to the classic car. 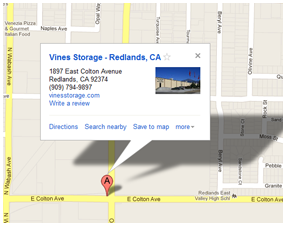 At Vines Storage in Redlands, you will find the secure space your classic car deserves. Vines Storage facility is a converted warehouse that has ceilings high enough to house large RVs. Our indoor space has been designed in such a way to allow our customers easy drive-in access to their vehicles. While there are also outdoor storage areas where vehicles can be parked and covered, the greatest amount of protection from the elements clearly comes from secured indoor storage. Top of the line vehicles deserve top of the line storage and that's what they get at Vines Storage. Storing a classic car at home is convenient and it is free. Aside from these two factors, several more factors point to the benefits of facility storage for the classic car. The 24/7 surveillance and locked gates of a storage facility can give you greater peace of mind and more convenience. Call Vines Storage to learn about our leasing packages.